Starting in FY2017, the Sasakawa Peace Foundation (SPF) has adopted five priority goals. 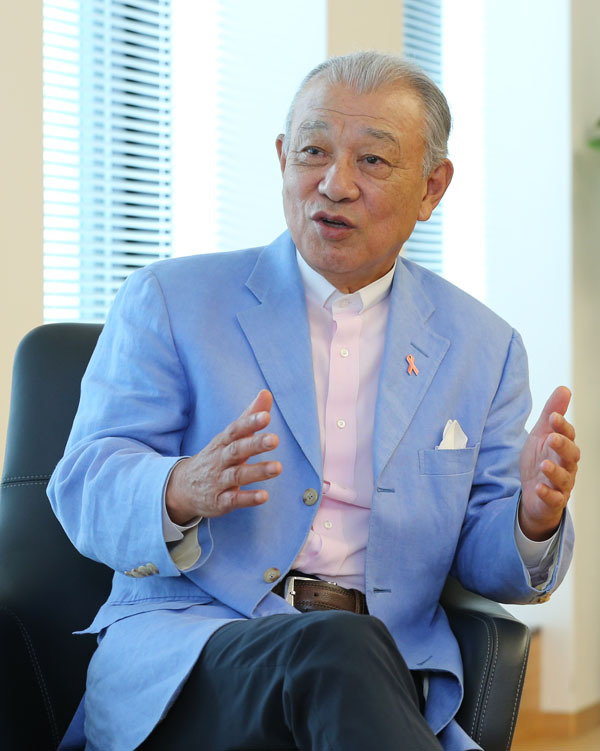 We asked the Honorary Chairman Yohei Sasakawa about their significance and other details. ―― The international community continues to face various issues and challenges. The human race never changes, living through a history of conflicts and confrontations. When we ushered in the 21st century, many intellectuals predicted that it will be a century of peace, as opposed to the 20th century riddled with wars. A quick look at today’s situations finds that, despite the lack of a large-scale war, the world is in greater turmoil with numerous regional conflicts that are becoming increasingly disorderly and complex. There is a mountain of challenges to be resolved. In the given situation, it is important to tap into our wisdom to prevent conditions from spreading or deteriorating further. ―― SPF was established in 1986. Looking back at its footsteps, how do you rate its activities? At the time of our foundation, “political” and “bureaucratic” circles handled everything, and there was no private-sector organization that approached international affairs like SPF does. In the age of complex and diverse challenges and excessive circulation of information, politicians and bureaucrats alone can no longer handle issues. There is a relative increase in the power of the private sector, highlighting the need for a private-sector organization with a purpose. In this sense, SPF has played the role of heralding this trend. ―― SPF has adopted five priority goals, namely (1) further strengthening the Japan–U.S. relationship, (2) expanding Japan’s presence in Asia, (3) enhancing understanding on and relationship with Islamic countries, (4) establishing ocean governance and (5) empowering women. Topping the list of our priority goals is “further strengthening the Japan–U.S. relationship.” The United States is the most important ally from political, economic and security perspectives. Yet, Japanese and American people do not necessarily have a sufficient level of understanding and awareness about each other. We must promote further progress in private-sector networking to continue to build close bilateral ties. In the area of national security, in particular, SPF uses its position as a private-sector organization to promote numerous initiatives from multi-faceted perspectives. As for the living conditions of people in Asia, many countries and regions face a multitude of challenges including population and environmental issues. Japan is known to have already experienced many such challenges ahead of other Asian countries. SPF is exploring measures required for Asia’s sustainable development by sharing extensive information about similar cases in Japan and solutions the nation has adopted. Asian countries are expecting Japan to take a more powerful leadership. Our nation must demonstrate its leadership capacity, as SPF also shows its own presence. There are numerous Muslim nations in the world, with the number of people who follow Islamic religion rising. Some predict that Muslims will become the largest religious group in the world in terms of population. Yet, Japan is slow to establish awareness and understanding about people who live in Islamic societies. This lack of knowledge is a problem in itself. It is necessary to promote greater awareness and understanding. With regard to women’s empowerment, Japan must ensure greater involvement of women in a variety of fields including politics, economy, education and science in order to exert its influence further in the international community. Focusing on women’s roles in society, SPF will support the social participation of women in Asia in an effort to find fresh answers to various international issues and challenges. ―― The issue of ocean governance is also important. Although there are five oceans, including the Pacific, the Atlantic and the Indian Oceans, our planet is covered with one sea, which represents 70% percent of the surface of the Earth. It is a beautiful, blue planet of water, as seen by astronauts in outer space. There are no visible national borders, racial divisions or conflicts. It looks like a peaceful planet in space. That is what the Earth should be. However, in reality, the planet is saddled with numerous conflicts, including disputes over maritime interests. The oceans of the world are deteriorating to a critical extent amidst rapid changes associated with global warming, ecological impact of human economic activities and confrontations between countries over claims of territorial waters. We are in a state of crisis with no time to waste. The death of the oceans means the demise of the human race. We have highlighted the question of how the marine environment can be sustained to maintain human civilization on this planet for 500 years or 1,000 years to come. This question has resonated with and gained support from many people around the world. We plan to eventually raise the issue as a discussion theme at the United Nations. ―― Can you explain why the five priority goals have been chosen? There is a trend toward specialization. While the world faces numerous challenges, there is no way SPF could address all of the world’s challenges. “Selection and concentration” are important for us to become an organization with distinctive character. I believe we live in the age where issues must be explored narrowly and deeply, rather than broadly and shallowly. This approach will win respect for and give greater presence to SPF. ―― What will be the future roles of SPF? The government alone cannot gather all information or build a required human network. Our role is to take advantage of our status as a private-sector entity to gather information, conduct research and recommend policies. Yet, we do not have enough presence unless our recommendations are reflected to legislations. SPF must strive to become a “Think and Do Tank” rather than the conventional “Think Tank.” We will maintain our future-oriented stance in evolving into an organization with a real sense of presence.